Click on a left or right-side panel arrow to expand or collapse the panel. The side panes will contain additional summary data or filtering and viewing options. Choose a Dataset. 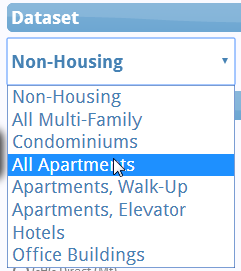 The default when the Map first loads is the dataset for all Non-Housing building classifications. Contact us to develop additional dataset views that have specific meaning for you. Click on any of the "View" choices to change the measurement values used to size the circles on the map. Click on a Building Group legend circle to exclude or include a whole group from the map and summary totals. The aggregate totals at the bottom of the map are adjusted as you filter the data, as is the Summary side panel data table and pie chart. Point to any building (circle) to see the Details for the building. No clicking necessary. The circle you are looking at will turn white and become a little larger to highlight that it's the building you're looking at. For bar, pie or scatter plots that have options, click on the option buttons to change the visual. 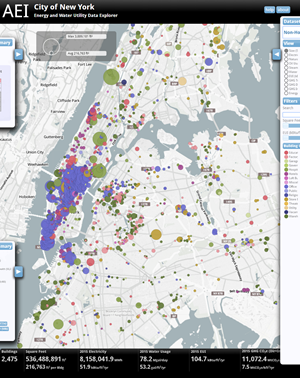 When the visualization first loads, the default view is to show each building with a circle color-coded according to its Building Group, and with a diameter proportional to its relative size in square feet. The Building Group legend at the bottom of the right flyout panel shows the self-reported "Primary Use" that we use as the definition of the Building Group. In the top left corner is a small legend that shows the scaled size of the average and maximum circles. This legend will change according to the View you select from the right panel, and according to any Filters you might apply so that it only reflects the values of the visible facilities. The bottom edge of the visualization shows a selected set of aggregate values which are also dynamically recalculated as you change the View and Filters. The left edge of the visualization has two additional panels. The lower of the two is summarized view of all the facilities in scope, along with a summary table for each Building Group. The table of data can be sorted in order to show a rank for each group according to the selected attribute. When the visualization first loads, there are 2,475 buildings in scope from the "Non-Housing" dataset with a combined square footage of over 500 million square feet. In the right panel at the bottom, click on any of the circles for individual Building Groups to remove those buildings from view, and see that the aggregate values will adjust to reflect the new aggregate values. The Building Groups area in the right panel is both a legend for the points on the map as well as a way to filter and compare the aggregate values for different combinations of building groups. You can inspect individual Building Groups by first clicking the "all off" link in the Building Group title bar, then select individual building groups one at a time. The Energy Map offers several different Views of the available data. The View you select determines the values that are used to determine the size of the circles on the map. As you switch views, the circle sizes will change according to each building's relative measure for the chosen view. Click on arrows on the right side panel to open the panel wider. Choose a View from the top section. The default view is Size (in ft2). Choosing a particular view could result in disappearing facilities that have zero values for a given view. For example, very few facilities have Steam usage in 2015 so those with steam usage of zero will disappear from the map. They will, however, remain in the building count summary and are included in any calculations of average values. Each time you change the View, the circles on the map will change size according to the values for each building. Switching among the different views is a quick way to get an overview of the relative amount of each commodity or measure for all the buildings in scope. Switch the View selection to Oil and see that many buildings disappear from the map; only those facilities that consumed heating oil or diesel fuel in 2015 remain. A quick scan of the remaining facilities shows there are roughly half a dozen facilities on the map that are very large oil consumers relative to most others. We notice on the scale at the upper left that the maximum building uses 120,531 MMBtu of oil, and with a quick visual inspection we can find this facility in lower Manhattan, Warren Weaver Hall which is part of the NYU campus. Given it's size of only 159,000ft2, it's likely that this facility consumes oil on behalf of some other buildings on the campus. Mouseover any building in any view to see the details for the building. In all cases, the values used to determine the circle size for a given view can be found in these details. When we do this for Warren Weaver Hall, we can see that the EUI for this building is crazy high, further supporting our idea that it may be the consumer of certain fossil fuels that are used to heat or power other buildings on the campus. Otherwise, the EUI for this building doesn't make much sense. Use the Square Feet slider control to filter the data to include only those facilities in a certain size range. Use the EUI slider control to reduce the dataset to only those facilities in a certain EUI range. The aggregate totals at the bottom of the display will update according to the filter conditions you have set here, and you can use these filters in combination with the Building Group filtering. For example, you could limit the map to show only buildings in the "Hospitals and Health" group of size 100,000ft2 or larger by setting both filters. 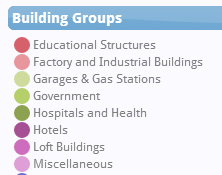 Click on a circle in the Building Groups legend to show or hide facilities according to their PLUTO Building Class. To show a single Building Group, first click the link that says "all off" and then select the desired building group. The aggregate totals at the bottom of the display will update according to the filter conditions. Note that for certain datasets, the Building Group uses the PLUTO Building Class designation, and in cases where the dataset is slightly more restricted (e.g., Condominiums), the Building Group will instead use the PLUTO Building Sub-Class designation. This is an aribtrary choice only intended to allow for more refined filtering capabilities. Use the mouse to point to any circle and it will turn white to show it is selected, and a pop-up panel will appear to show details about the building. The small bar charts show key metrics for the building. 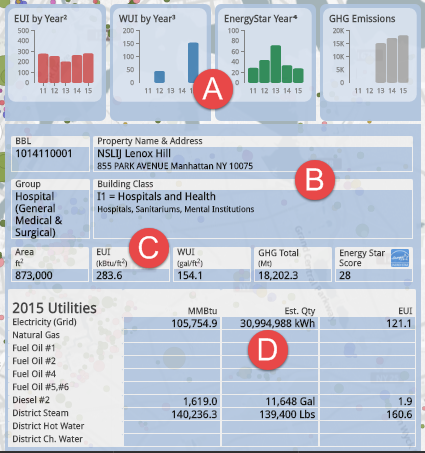 Shown left to right, respectively, are the EUI (Energy Use Intensity), WUI (Water Use Intensity), the building's Energy Star score, and the GHG (Greenhouse Gas in MT). The values shown are self-reported values from the building owner since 2011. Note that a zero value for a given metric or year is likely a case of unreported data rather than an actual zero value. In the case of GHG, we show the indirect and direct GHG in a stacked bar chart with direct GHG in dark gray and indirect as light gray. In this area we show basic property information. The BBL is the Borough-Block-Lot number for the property which uniquely identifies a building and is a key value used to link the PLUTO data to other data sources. The Property Name and Address are also from the PLUTO database, or in certain cases were populated from the Google Maps Geocoding service. The Building Group designation is the building owner's self-reported Primary Use designation for the property. This value from the LL87 dataset may seem slightly vague or arbitrary in the context of the adjacent Building Class values which is a more formal pair of Building Class and Sub-Class designations that come from PLUTO. This area of the Details panel reports a few 2015 metrics of interest for the building. The values shown will match the 2015 bar chart values shown in the bar charts described above. The Building Area in square feet is the self-reported LL84 value (the dataset also contains the Department of Finance LL84 estimated square footage and the GFA Gross Floor Area "GFA", neither of which are shown in the Details panel). All values reported in this area of the Details are from the LL84 dataset. The values reported by the property owners are shown in MMBtu, and we make an estimated calculation of the commodity usage in the units of measure appropriate for the commodity. For example, we estimate the electricity kWh by using the conversion factor of 3,412 Btu/kWh. Therefore, you should consider the MMBtu values as the values of record and exercise caution when considering our estimated commodity values. 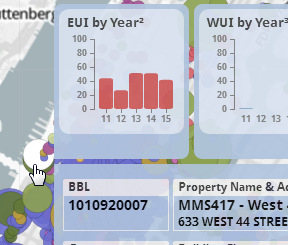 For the component EUI values shown, we simply use the reported MMBtu divided by the self-reported building Area. For example, a reported electricity usage of 100,000 MMBtu in a building of 1 million ft2 translates to an electricity EUI of 100. Click on the bottom left flyout panel to see a table of representative data for the Building Groups that are in scope. The table will show the relevant values for each Building Group according to the selected button under the pie chart. The default view is to show the Square Feet and MMBtu summary values for each building group. The pie chart to the right of the table will show you the proportions of each aggregate value by Building Group. You can use the button selectors below the pie chart to change the measurement property that should be aggregated; the pie chart and the data table will change accordingly. Once a view is selected, you can sort on any of the columns in the data table to order the building groups according to their aggregate value. Also note that the pie chart and summary data table will respond to filtered conditions you might set in the right flyout panel. For example, if you set a filter for Square Feet or EUI, or remove groups in the Building Groups legend, the pie chart and summary data will reflect the changes made to the filtered data. Click on the top left flyout panel to see real-time demand and a three-day forecast from NY ISO. The compiled data comes directly from NY ISO via their public access web serivces. Customers that sign up for our free AEI ISO Alerts will receive real-time SMS and E-Mail alerts during the summer cooling season when peak demands are likely to occur. For facilities that are sensitive to coincident high demands with the grid, it's a money-saving proposition to engage some demand response in advance of a potential peak demand day. We show the ISO conditions on the Energy Map as a set up for the obvious next step, which is to integrate the real-time building loads and BAS data so that a portfolio manager has a single place to go for an integrated view of current conditions in the region and the portfolio - all the information necessary to make better short-term energy purchasing and demand response decisions to inspection of trends and building comparisons for more informed capital investments and long-range planning. Lots of Data... What's the point? Great question! Given the volume of data buried in the billing records of a typical municipality, campus or in a portfolio manager's accounting software, the value of this data isn't always straightforward. It really comes down to the set of questions that a given constituency might ask and then whether or not the data can answer those questions. Our design goal wasn't intended to answer any specific questions, but instead to disaggregate and reassemble the data in certain ways that allows the creative user to interactively arrive at the answers to a wider range of unknown questions. In other words, to explore the data. How do the individual buildings in a Building Group compare to each other? What is the range of EUI in selected multi-family housing portfolios? How do our schools and municipal facilities compare to national averages after accounting for the harsh winters and hot summers in the Northeast? Given the relatively lower cost of natural gas and, conversely, the upcoming increase in electricity demand charges over the next two years, should I be looking to alter the energy mix at certain facilities? Which set of buildings have the best energy efficiency opportunities? With a versatile way to explore the data, we might find out that the questions can be as important as the answers. The Energy Utilization Index (EUI) is a measure of a building's energy consumption. The unit of measure for EUI is kBtu/ft2/year. To obtain the kBtu (energy) consumed by a building, we convert fossil fuel utilities into a common unit of Btu. Electricity is typically reported by the Utilities in terms of kWh, natural gas in therms, oil in gallons and steam in thousands or millions of pounds of steam. A year's worth of utility billing data is required since the EUI is defined as energy per square foot per year. Once converted to the common unit of measure, we divide by the size of the conditioned building space (in square feet) to arrive at the EUI value. A building with a lower EUI value than another is said to be more energy efficient. EUI values can range from an extremely efficient value of 35 to as high as 500 or more for very energy intense facilities such as supermarkets and hospitals. The EUI is a very simple calculation that can be made with nothing more than a year's worth of monthly utility bills for a facility. A more relevant set of calculations can be made when more data is available, such as seasonal EUI profiling, to determine if a building might have different efficiencies depending on the seasons of the year and the fuel supply mix. We like to think that an AEI Energy Map is a pretty intuitive way to explore the energy and water utiliy data for a large portfolio. But that doesn't mean we think it's the only way or necessarily the best way. If you have questions or recommendations on how an Energy Map should work - or could work better for you and your portfolio, please don't hesitate to ask. Write to us or call (800) 971-1124. We'd love to hear from you. "It's intuitive once someone shows you how to use it". The mash-up of data for this Unite Students demo application were drawn from some or all of the following public data sources. See ABOUT THE DATA below to understand the limitations and disclaimers about the specific data we used. The data in this mockup are mostly fictional. For the sake of the mockup, the data is an anonymized mash-up of several different data streams from a variety of AEI projects. Property names, number of beds and geo locations are accurate, taken from the public Unite Students website. Categorical building data (Building Type, Owner) are fictional, as is the calculation for occupied beds. Building sizes are a function of beds, slightly randomized across buildings anchored by a seed value each day (the occupancy percent does not change through the day). Interval data are transformed from City of Boston 2014 public disclosure, loosely associated with Unite properties based on building size. Real-time meter data are derived from real-time meters in Town of Berlin, MA, scaled to estimated Unite building sizes. (Though the extrapolated values are not real, it is possible to watch the EDT circadian changes over 24 hours - smaller values during the nights and weekends, higher values during weekday school hours. The school year ends on June 16, so after that day we expect lower weekday values.). All users found in Admin are fictional people. Real-time NYISO values are correct and accurate, as a simulation of a similar data feed from the UK National Grid. All fictional presentations of the data are only intended to reasonably demonstrate certain features which should be expected from ordinary utility bills, interval and real-time main meter data. You should not draw any operational conclusions from any reports, data presentations, or assertions made herein. With the recent proliferation of energy data sets comes the increasing challenge of how to consume the data in a meaningful way. Given our work as an energy services company, we were inspired to try and collect together a selected set of open data sources that focus on energy in order to deliver a comprehensive view of the data for municipal administrators, energy aggregators, energy managers and portfolio managers who have the need to understand the data but don't have a lot of free time to spend collecting, cleaning, and qualifying the data. They want and deserve a shortcut to the information value of the data that helps them understand how energy is consumed, how much it costs, and where the best opportunities for savings are hiding. Our design intent was to deliver an exploration tool that doesn't prescribe a limited set of questions that it will answer. Rather, our goal was to deliver an interactive tool that can answer a wide range of energy questions for any number of constituencies who wish to engage. Given our work with energy managers in the MUSH and C&I facilities in the Northeast, it should make sense that our main motivation was to deliver a holistic and interactive entry point as a natural segue into the more detailed work that we do at individual facilities. With this approach a wide range of interests are served at a very high exploratory level, but we set the stage to dig deeper into more specialized reviews within individual facilities. Finally and for good measure, we designed this Energy Map visualization to be compatible with the popular data sets in the space: Green Button, MEI data popular with many of the Green Communities in Massachusetts, LL84 in New York City, Socrata, OASIS, Energy Portal Online interval data provided by the region's utilities and a wide range of web services designed for the integration of varied data sources. With this, we have developed an exploration tool that is plug-compatible and easily deployed for any city or town, any university or college campus, or any property management portfolio that is looking for a comprehensive view of their energy use. The AEI Energy Map visualization, all of its properties, methods, and visual design are copyright ©2017 Advanced Energy Intelligence, LLC and may not be reproduced, excerpted or hosted without our expressed written consent. The visualiztion, its calculations and presentation are provided as-is and without any warranty expressed or implied. Use at your own risk. If you wish to carry a link to this visualization, please contact us for a permalink. For more information contact AEI at info@aeintelligence.com. and ◄ arrows on the side panels to make them more or less visible. 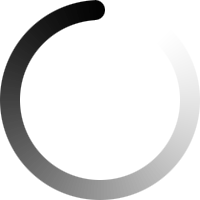 Mouse hover on any circle for building details. button at the top right corner of the map.